Dunlop, internationally renowned racket sports brand and market leader in padel bats in Spain, and BASF, the world’s leading chemical company, have developed a new technology that marks a breakthrough in padel bat performance. The new technology, Power Flexconsists of the application of a revolutionary material developed by BASF: Infinergy, the world’s first expanded thermoplastic polyurethane (E-TPU) is applied to the core of the padel bat. Its unique elastic properties and extraordinary resilience offer clear advantages in playability and durability of the bat. The Infinergy material from BASF is as elastic as rubber but lighter. As such, it provides the optimal weight parameters. The high elasticity of the material delivers explosive power and greater comfort as balls rebound faster off the bat. At the same time, Infinergy is an extremely durable material and maintains its properties across a broad range of temperatures. As a result, the durability of the bat in optimal condition is extended, and the bat performs exceptionally in all weather conditions, maintaining its performance in temperatures as low as -20ºC to well above 40ºC. After almost two years of cooperation and development between both companies, and numerous tests performed by members of the Dunlop Team of players and coaches, including current World Champion Juani Mieres, the first Power Flexbats will be launched as part of the Dunlop Padel 2016 collection. “ThePower Flex technology represents a giant step forward in the performance of the padel bat and at Dunlop we are delighted to be the chosen partner of BASF for padel and to have managed to develop this revolutionary breakthrough together,” said Richard Jackson, Head of Marketing for Dunlop Padel. “We are very excited about the development of the Power Flex technology using our Infinergy E-TPU. The partnership with Dunlop allows us to introduce our know-how and expertise in a new application area in cooperation with a market-leading specialist brand,” said Andy Postlethwaite, Senior Vice President, Performance Materials Asia Pacific, BASF. 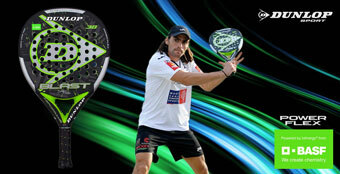 The star product from the new Dunlop Padel collection for 2016 is the model Dunlop Blast, the new bat of choice for Juani Mieres on the professional circuit. It offers an oversize hybrid head shape with a large sweet spot and incorporates Aeroframe with the aerodynamic frame profile for faster reaction on defensive shots and greater swing speed on attacking shots. Vibro Pods with silicon pods inserted into the frame around the hitting area absorb vibrations and offer greater comfort and 100% Carbon with a carbon reinforcement in the base of the bat for greater stability and superior control. In combination with the new Power Flex technology that provides extra power, comfort and durability, the new Dunlop Blast is one of the outstanding padel bats models for the 2016 season.